In today’s previous post The End of Hens: Inside a “Spent Hen” Slaughterhouse, UPC wrote that ALL egg-laying hens are trucked to spent fowl slaughter plants. Not quite all. In addition, millions of hens are now being gassed to death with carbon dioxide (CO2) at the farm site or somewhere. 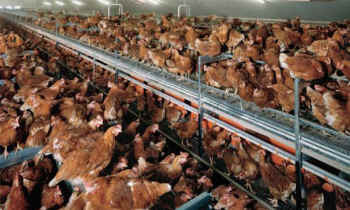 CO2 is increasingly used to exterminate “spent” hens because it is cheap and readily available. Typically the CO2 is pumped into containers filled with smaller groups of birds to destroy them. The types of containers include metal boxes, barrels, sealed dumpsters, and Modified Atmosphere Killing carts. With CO2, the birds experience freezing temperatures and painful injury caused by the high pressure jet stream of burning cold gas. This is exactly what Black Eagle's organic hen unit looked like when UPC visited in 2011. In phone interviews with UPC president Karen Davis in 2011, John Dobbs, a former employee at Black Eagle Farm in Virginia, described the depopulation of the “cage-free” flock of egg-laying hens he witnessed in December 2009. Grab the hens by their legs off the perches and floor, take them out of the house and stuff them in metal boxes 2 ft. wide x 5ft. long x 3 ft. deep. Put 200-500 hens in each box. Four or five metal boxes in all. Stick a rubber hose attached to a CO2 tank inside the box and shoot cold CO2 into the box through the nozzle until the hens flop around. The birds on top burn and suffocate to death from the freezing CO2. Go here for the whole story - Black Eagle Farm: Story of an Organic Egg Scam.